Just popping in to let you know I am busy dusting off the shelves in my etsy shop, VintageHome, to make room for some freshly handmade-from-vintage things today at 10 am PST. Yikes -- that's any minute now. Hope you're have a wonderful day. You are into vintage, great name great blog, love how you put it all together..nice work. you are hilarious!! 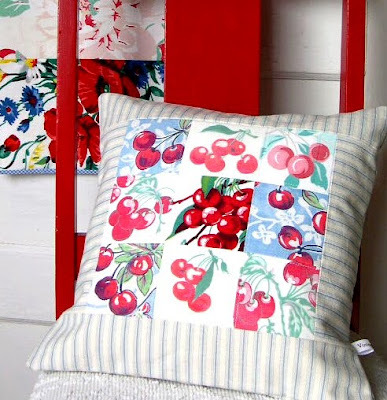 what a fun read to get me going this morning...(your post on the tablecloths from Meadowbrook) your sense of humor is great & I love love all the fabulous stuff you make. Now let me say that pillow is absolutely precious! Cherries! What a cute pillow. You do beautiful work! Thanks for stopping by my blog, and good luck in my giveaway! Oh, I knew that white daisy on red would go quick! Cute stuff, friend. Around here cherry fabric always seems to have a black background, euuwww. Your selection is delightful as is your pillow!